Yofix, launched the first grain, seed and lentil based, pro-biotic yogurt which is clean label and traditionally manufactured. The company’s products are rich in calcium, protein and dietary fibers and are cholesterol free. Yofix products offer a great nondairy alternative with comparable nutritional values and favorable texture and flavor and without the use of any additives or stabilizers. The company uses an “all-in” technology with zero waste which minimizes the environmental impact, not only compared to dairy based products but also with comparison to other plant-based alternatives. Yofix, founded by Ronen Lavee, is one of several startups incubated in The Kitchen Hub, Strauss Group’s FoodTech incubator, supported by the Israeli Innovation Authority. Starting with a prototype, Yofix received seed funding, mentoring and support at The Kitchen and expertise from numerous resources at Strauss Group. “We were fortunate to be accepted to The Kitchen and to receive mentorship, coaching and support. With the investment and support from Strauss Health, we will launch our product nation-wide in Israel, follow up with a line of new products and start international marketing.” explains Lavee. 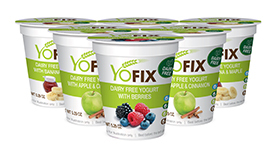 Yofix develops and manufactures dairy & soy free fermented plant base pre & pro-biotic foods. Excellent taste and texture, clean label – no artificial or preservative added, made of cereals, lentils, grains and seeds contain high nutritional values at competitive costs & sustainable production process. The first product ready to market is a plant base yogurt which will be followed by yogurt drinks, deserts, frozen yogurt, ice cream base and more. The Kitchen Hub is a Food Tech incubator owned by Strauss Group and backed by Israel Innovation Authority. Food Tech starups admitted to The Kitchen receive equity investment, office space with access to labs, mentoring and coaching and vast network of contacts within the local and global food industry. The Kitchen has invested in 7 companies in different areas along the food supply chain and has taken an active role in growing the Israeli Food Tech ecosystem connecting it with global players.